Pure saffron was known to grow in and around Lancaster, PA, cultivated by the German immigrants who settled there in the 1730’s, primarily for domestic consumption, but with surplus sold at market. This information is of particular interest to me in that Martin’s ancestors were in Lancaster Co. by 1730 and have been documented as growing and using it from the time it was first cultivated there. In 1905, it was reported that a great deal of saffron had been cultivated in Pennsylvania over the previous century, but that the growing of it was, “dying out with the generation of the Pennsylvania German housewives now passing [away].” The girls growing up who would be the next generation to tend the gardens, rarely wanted to grow saffron, instead, they began replacing it with plants which required much less care, such as strawberries. The Pennsylvania Dutch considered tending the kitchen garden, including the saffron beds, women’s work. “The cultivation of saffron is on the wane; the present generation of women are unlike their grandmothers, for it was the old ladies of the past generation who took an interest in the subject”. Indeed, what would those, “old ladies”, think today if they knew how rare it is to find anyone in Pennsylvania who still grows crocus sativa in order to harvest saffron? – – Coffee and Tea Industries. Vol. 35. July 1912. The Crocus Sativa from which saffron is collected is a late fall bloomer, not the spring blooms most gardeners are familiar with. It “differs from those of the same colour that appear in the spring, chiefly by having the three extremities of the pistil so long as to hang out of the flower”. The bulb beds could sometimes do double duty, first producing a crop of radishes, cucumbers, or lettuce which was grown on the surface above the bulbs, harvested, and cleared away before time for the crocus blooms. The areas where the saffron crocus chiefly grew were Lebanon, Lancaster, and Berks counties. Once planted, the beds produced for three or four years, the flowers becoming larger and more numerous each year. As that was happening, the bulbs were reproducing so that when the production slowed, the bulbs could be divided and transplanted. – Willich, Anthony. The Domestic Encyclopedia. 1821. Philadelphia. “When the flower appears as soon as the foliage the yield [of saffron] is most abundant; the flowers are plucked daily, early in the morning, and it is usually made the evening work of mother and other helpers to separate the stigmas. The gathering of the flower covers eight or ten days, sometimes longer, depending largely upon weather conditions; much more tedious is the caring for the trifid stigma; there is an art in rightly plucking and separating it from the yellow style; some women are quite expert in this branch, as was demonstrated to me…”. Richard Bradley documented how to dry saffron between layers of paper and horse-hair and form it into cakes in an English cookbook in 1736. The Pennsylvania Dutch housewives used that method in Pennsylvania. –The Country Housewife and Lady’s Director. 1736. London. The quality of the Pennsylvania-grown saffron was considered excellent when most of that coming from abroad was adulterated by adding various inedible materials to stretch the quantities of the actual spice. A steam bakery in Philadelphia produced “spice biscuits” which were made from the lowest quality wheat meal and “sweepings” moistened with water and baked into hard brown biscuits. The biscuits the adulterant most often used to extend the actual spices sold in the shops. “Saffron” sold by the spicers sometimes contained no actual saffron at all, and were just ground marigold petals. It is easy to see why that grown by the Pennsylvania ladies was so well regarded as it was pure and clean, and in Philadelphia, worth its weight in silver. American Journal of Pharmacy. 1865. Several 18th and 19th century books noted that safflower was grown in America and sold under the name saffron, but pointed out that the article grown in eastern Pennsylvania was the genuine Crocus Sativa. 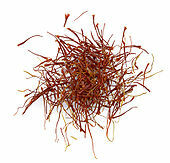 The Mexican saffron sold in markets today is safflower, and not real saffron. The only similarity is the color it produces when added to soup or other dishes. Safflower adds no flavor and is not an effective substitute for saffron, neither is turmeric, paprika, or annatto which are sometimes used as colorants. Like safflower, they add color but do not provide the flavor of genuine saffron. Pure saffron is the most expensive spice in the world. It is usually sold in fractions of an ounce and may only be available by mail order, depending on where you live. It is best to purchase the threads and process it yourself so you know you’re getting what you pay for. Ground saffron is often still adulterated with safflower or turmeric. In researching Pennsylvania Dutch foods, I was pleasantly surprised to find Mrs. Ira F. Zartman had contributed several recipes to Ruth Hutchison’s The New Pennsylvania Dutch Cook Book published in 1958, one of which was soup with saffron. I immediately went to Rufus Zartman’s 1907 book on the Zartman family to figure out the family connection. Ira’s father was Eli Kline Zartman born in 1873; his grandfather was Martin Zartman born in 1845; his great grandfather was Israel Zartman born in 1817; his 2nd great grandfather was John born in 1789; his 3rd great grandfather was John Michael, commonly called Michael, born in 1754; his 4th great grandfather was Alexander Zartman II born in the Palatinate in1731; and his 5th great grandfather was Alexander I, the original Zartman immigrant to the U.S. The senior Alexander, his son, Alexander II, and additional family members arrived in Pennsylvania in August 1728 and settled in Lancaster County. Dr. Ira Forry Zartman was born Dec. 18, 1899 in Lititz, Lancaster Co., PA and married Edith Wenger on June 3, 1924. He served as President of the Zartman Family Association after the death of founder, Rufus Zartman. Edith Wenger Zartman’s recipe for CHICKEN CORN SOUP has a quote attached regarding growing and using saffron. “A pinch of saffron adds delicate flavor and golden coloring. Every well-run house once had its saffron bed. The star-shaped blossoms are a beautiful lavender and resemble clematis. Only the pistils are dried and used for coloring. Nowadays saffron must come from the drugstore…This soup is a favorite summer soup in Lancaster County. It has been used for generations for Sunday School picnic suppers”. Martin is a direct descendant of Alexander Zartman I through his son, Hans Jacob Zartman. The chicken corn soup is a Pennsylvania Dutch classic and certainly was served to Alexander and his countless descendants. In fact, Edith’s recipe could have come down through several generations of Zartmans. I found a source for authentically grown Pennsylvania saffron and purchased enough to make several pots of soup, and to make sure we have saffron for future use, I also obtained crocus sativa bulbs from the very kind farm-woman in Lancaster County who still grows them and harvests the saffron. How is that for finding an authentic Pennsylvania Dutch recipe? I consider myself extremely fortunate to have found this recipe as Edith Zartman died in 1960, a mere two years after the recipe was published. Mix the beaten eggs with sifted flour and salt, adding water to make paste. Roll out very thin on floured board, roll up like jelly roll and slice across, very thin, with sharp knife. Measure about ½ cup of noodles and unroll them as they are dropped into the soup. Boil together for 5 minutes. Add corn, boil 3 minutes longer. Stir in the eggs (raw eggs add more flavor but use chopped hard-boiled eggs if you prefer), add parsley and seasoning. Serve with slices of home-baked bread.